Forest A restriction placed on the land and the natural features of the land usually shown on the record plat of subdivision or recorded by a metes and bounds description. Its terms and conditions are recorded in the County’s land records. Most commonly, the agreement prohibits removing vegetation, and prohibits changing the scenic and arboreal character of the land without written permission from the Planning Department.conservation easements protect a forest on private land by limiting certain activities, making up an integral part of the County’s forest protection strategy. Easements are generally created as part of a forest A document that outlines the specific strategies for retaining, protecting, and reforesting or afforesting areas on a site, pursuant to the 1991 Maryland A biological community dominated by trees and other woody plants (including plant communities, understory, and forest floor) covering a land area which is 10,000 square feet or greater, and at least 50 feet wide. For the purposes of implementing the Montgomery County Forest Conservation Law, this definition is interpreted to mean those areas that have at least 100 trees per acre with at least 50 percent of those trees having a two-inch or greater diameter at 4.5 feet above the ground. Forest does not include orchards.Forest Conservation Act. A biological community dominated by trees and other woody plants (including plant communities, understory, and forest floor) covering a land area which is 10,000 square feet or greater, and at least 50 feet wide. For the purposes of implementing the Montgomery County Forest Conservation Law, this definition is interpreted to mean those areas that have at least 100 trees per acre with at least 50 percent of those trees having a two-inch or greater diameter at 4.5 feet above the ground. Forest does not include orchards.Forest Conservation Plans are approved by the Planning Board with conditions that are binding on applicable private and public development, and certain land disturbing activity.conservation plan, which is required by property owners developing parcels of 40,000 square feet or greater. To date, the county has protected about 9,700 acres – approximately 3.5 percent of the county – through forest conservation easements. There are two main types of forest conservation easements, each with its own set of goals and limitations. Environmental planners have mapped the approximately 3,000 easements across Montgomery County to inform the public about how to respect easements and protect natural resources. Q: Does an easement apply to me even if I’m not the one who put it on my property? A: Yes. A forest conservation easement is a perpetual covenant that runs with the title of the land, no matter how many times the ownership changes. Q: What are the consequences if my easement is not a forest? A: The legal documents of the easement give the Planning Department the right to periodically enter a property and inspect the easement to make sure no violations are taking place. If violations are found, the Planning Department has the right to enforce the covenants of the easement through legal action, which may include substantial monetary fines. Q: What do I do if my easement isn’t completely forested? How do I get in compliance? A: We have some tips to ensure your easement is forested. Also, you can contact a Planning Department forest conservation inspector to further explore your options (see inspector map above). Q: What if I don’t want my easement? A: Since easements are legal agreements that run with the land, regardless of the property owner, a resident must go through a legal process with the Planning Department to make changes to an easement. A hearing with the Planning Board will be required, and in the unlikely event that the Board rules in favor of removing the easement, the resident will still have several obligations. They will be required to amend their property’s forest conservation plan, resubmit a record plat showing the new easement, and probably have off-site mitigation requirements. This entire process can take months, perhaps up to a year. Q: How do I view the legal documents for my easement? A: The County Circuit Court Land Records Department records the legal documents for each easement in Montgomery County. You can also check out our Easement Locator Tool to see easement details. Q: How do I know if I’m subject to the Forest Conservation Law? A: If you are developing a small portion of your property, such as building a pool or landscaping, and you need to clear more than 5,000 square feet of forest, you may be subject to Forest Conservation requirements. You can also check our Forest Conservation webpage for more information. 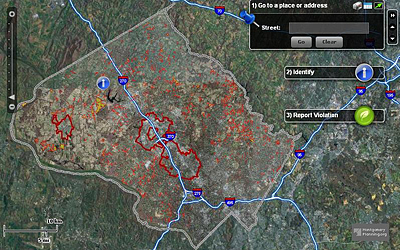 Q: How much is Montgomery County is covered with forest? A: Some 93,000 acres, or 29 percent of the county, is covered by forest. Q: How many forest acres has Montgomery lost to development? A: Since 1992, Montgomery County has lost some 4,400 acres. Q: How much of Montgomery County is covered in easements? The Planning Department employs a team of inspectors to ensure the quality of the county’s conservation easements and forest conservation plans. Forest inspectors use air photos with mapped conservation easements and make site visits to ensure the integrity of easements as well as Planning Board-approved Forest Conservation Plans. Meet a Planning Department forest conservation inspector.